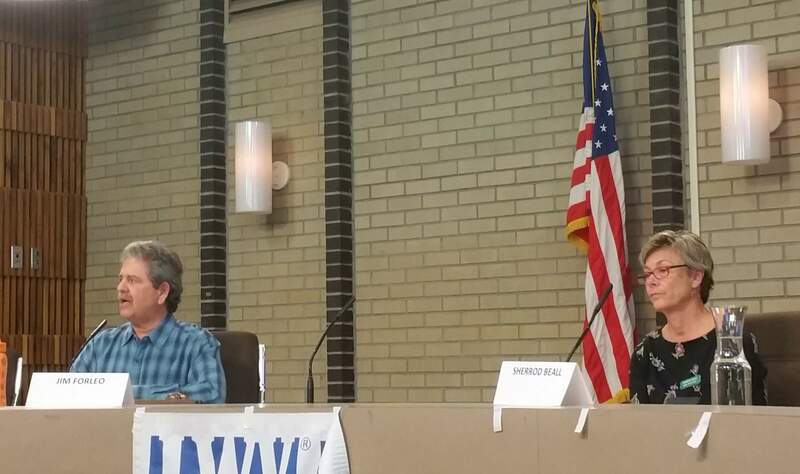 Jim Forleo, with Clean Water Durango, and Sherrod Beall, with the No on 1A Campaign took questions about fluoride at a televised League of Women Voters forum Thursday at Durango City Hall. The council candidate discussion was less divisive, with the candidates finding common ground on several issues. Secondary housing units, once divisive in the community, drew general approval from the candidates as long as they are regulated. If residents in additional neighborhoods would like secondary units legalized, they would need to ask council to change the land-use code, Brookie said. The councilors also generally agreed that they would talk with the neighborhood about how to develop the Mason Center, but they would like to see it be used as a park. Youssef suggested using part of the space for parking to alleviate the pressure on the neighborhood and McHenry agreed. “Parking is a huge issue in that area,” she said. The group presented various ideas to pay for infrastructure projects. Bettin and McHenry suggested asking voters to reallocate half of the 2005 half-cent sales tax for infrastructure projects. Half of this revenue must be used to pay off debt on Durango Public Library and Florida Road until 2026. Youssef would like to see the new council take a comprehensive look at all of the city’s needs. Once all those needs are understood, she would consider asking voters to reallocate the tax and increase the lodgers tax to fund infrastructure. Brookie explained most of the city’s projects, such as water, sewer and roads, are prioritized as part of a five-year plan. But the city has some unfunded needs like stormwater drainage projects, and future city councilors will have to struggle with those. Eskew said the city has money for projects, but they need to be prioritized. Recorded copies of the forum are available at the Durango Public Library.